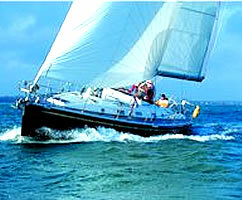 from the designers Holman and Pye, inspires complete confidence with excellent sailing performance and quality of design. 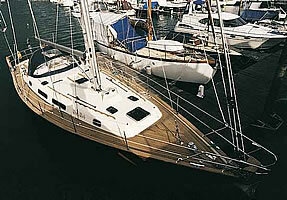 The Rustler 36 is very much a yacht for the experienced and discerning sailor. She is built to the highest specification for serious blue water cruising and has an enviable reputation for performance, longevity, comfort and value for money. She is immensely strong, hull and deck mouldings are laid up by hand to Lloyds Register approved specifications using Lloyds approved materials. The coachroof and inner coamings are stiffened with end core balsa and all deck fittings are reinforced by marine ply pads. The hull, deck and bulkheads are bonded with the toe rail through-bolted and sealed. Each yacht is customised and hand built to an owners specification. Rustler 42 - Designed by Stephen Jones with fast, safe passage making in mind. Combining style that is traditional yet modern with a proven cruising layout and excellent sailing performance, the result is a classic combination built to last a lifetime. 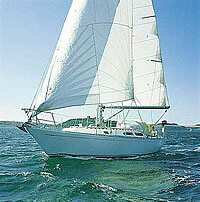 Her long fully encapsulated lead keel and big skeg hung rudder give her excellent directional stability in any seaway. Her generous displacement, safe performance and sea kindly characteristics make her a very forgiving and confidence inspiring yacht. Primarily, the Rustler 42 accommodation is designed for living in safety and comfort when under way. However, the spacious, light and airy saloon and galley area make entertaining and living in harbour everything you desire. Every Rustler 42 is built to take the worst of prevailing seas, to look after her crew and inspire every yachtsman with blue water aspirations. The Rustlers heavy weather characteristics are why many are being sailed on long distance cruises, a few are on single handed passages but usually they are sailed by couples who find the safe ease of handling ideal for short handed sailing. She is immensely strong, hull and deck mouldings are laid up by hand using quadraxial matting with isophalic resin. Bulkheads are fully glassed to the hull and deck. Together with substantial stringers and a lead encapsulated keel the result is a yacht with unrivalled strength and endurance. Each yacht can be customised to an owner’s specification. 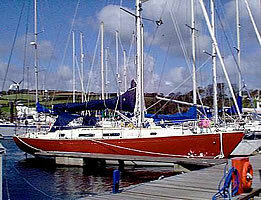 However the Rustler 42 has been perfected over many boats giving a well proven standard configuration. 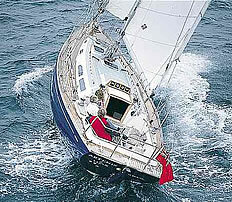 Further details about the Rustler range can be found on www.rustleryachts.com. Bowman 42 - Builds on the fine heritage of the popular Bowman 40 and incorporates a host of refinements including a deeper draft with new skeg and rudder profile, which has provided enhanced sailing performance. 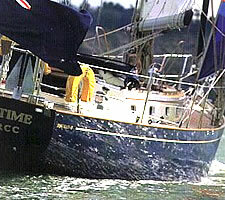 Her paces were shown in the ARC Transatlantic Rally where the Bowman 42 "Eternity of Hamble" won her class and finished 5th overall, one of the four yachts from the Rival Bowman yard taking part in the event. The Bowman 42 combines the skills of top cruising yacht designer; Chuck Paine, with the exceptional building expertise of the Rival Bowman craftsmen. The interior layout of the Bowman 42 can be tailored to an owner's specification, providing the yacht with an individual custom-built character. Whatever the chosen layout, the accommodation will share the style and craftsmanship which has earned Bowman an enviable reputation for quality. Bowman 45 - An outstanding long distance cruising yacht boasting many of the highly praised interior features of her bigger sister the Bowman 48. Offering genuine luxury accommodation, the Bowman 45 has been developed to explore the oceans of the world in safety and comfort while giving her owner complete confidence in her ability to handle any conditions she may encounter. As with all Bowman yachts, the interior of the 45 can be tailored to an owner's specification which provides each and every Bowman with that special custom-built character. An array of opening ports and hatches provide plenty of fresh air and daylight. Forward facing windows in the main saloon add a welcome brightness to the living area. Bowman 48 - An outstanding long distance cruising yacht boasting many of the highly praised interior features of her bigger sister the Bowman 48. Offering genuine luxury accommodation, the Bowman 45 has been developed to explore the oceans of the world in safety and comfort while giving her owner complete confidence in her ability to handle any conditions she may encounter. The Bowman 48 is now available in two versions, the well known Aft Cockpit (AC) and the new Deck Saloon (DS). The DS version offers the same superb quality of accommodation as the AC but with a central cockpit configuration which provides a bright and airy day cabin. Further details about the Bowman range can be found on www.bowmanyachts.com. Starlight 35 - The designer of the Starlight 35 Mk2 , Stephen Jones, has achieved an enviable reputation for his exceptional vision in hull form which has produced many of the most successful racing yachts in the UK in recent years. In the Starlight 35 Mk2, Stephen has provided a fast hull and easily manageable sail plan, combined with an accommodation layout which combines space and comfort with safety and seaworthiness. She was chosen by the judges in the Yachting World Rally as the best yacht in her size range. The Starlight 35 Mk2 enjoys exceptional qualities of thermal and acoustic insulation achieved by a building process which incorporates an inner and outer moulding, enclosing a foam core. This provides a hull which is quieter, warmer and has a noticeable lack of condensation compared with conventionally constructed yachts. The ambience achieved in the cabins from this construction method is therefore exceptional. Starlight 39 - Stephen Jones designed the Starlight 39 with exceptionally beautiful lines to be a fast, safe, passage maker which would be a joy to sail. Stephen's successful design skills, coupled with the quality workmanship of the Rival Bowman craftsmen have developed one of the most successful yachts in her class.The Starlight 39 also enjoys the same exceptional qualities of thermal and acoustic insulation as the 35. Inside the hull, the deep bilge prevents any water from running into the accommodation when the boat is heeled. The half depth skeg, provides a lower bearing for the substantial rudder and ensures that the Starlight tracks straight without constant attention to the wheel. It is this attention to detail that makes the Starlight 39Mk2 a thoroughly seaworthy vessel. Starlight 46 - The latest addition to the Starlight fleet combines the talents of two of the top UK yacht designers. Stephen Jones, who has already displayed his skills with the Starlight 39 and 35, and Jonathan Sherwill who has gained a world reputation for interior design and layout. The Starlight 46 is an ocean thoroughbred with luxury and style. Stephen Jones has achieved a deck layout which utilises all his experience and expertise in the ergonomics of sail control and boat handling. With a larger crew, the performance can be fully appreciated but without upsetting the comfort of cockpit due to the carefully positioned sail controls. The dedication of the craftsmen who build it and skills of the designers who have developed this handsome cruiser, have created a high quality, superb performance cruising yacht which will instil an exceptional pride of ownership. The views and information held within this site are intended only as a guide. Expert advice should be obtained before embarking on any boat purchase or training. 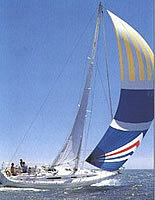 Sailing Info are not responsible for information held on any pages external to this website.